"BEYOND THE PLATFORM: NIGHT VISION", solo exhibit. A Pro Arts Project at Windows on Columbus, Christopher Columbus Drive, Jersey City, NJ. Aug. 6 - Nov. 28, 2011. Curated by Kerry Kolenut. On display is a solo exhibit of Daryl-Ann Saunders' color photographs taken at night from subway platforms. The exhibition is on view 24 hours a day, 7 days a week in the expansive lobby of the Mack-Cali building at 135 Greene Street in downtown Jersey City as well as from the display windows at the same address facing Columbus Drive. "Windows on Columbus" is an exhibition program sponsored by the Pro Arts JC organization at the Mack-Cali building. This exhibition venue is generously donated by Mack-Cali Realty Corporation. Pro Arts Project is made possible in part by funds from the New Jersey State Council on the Arts/Department of State, a partner agency for the National Endowment for the Arts and by funds from the National Endowment for the Arts, administered by the Hudson County Office of Cultural & Heritage Affairs, Thomas A. DeDeGise, County Executive, and the Board of Chosen Freeholders. "2011 DCA GRANT", Awarded by NYC Department of Cultural Affairs, NY. Jan 2011 - Dec 2011. Daryl-Ann Saunders has been selected as a 2011 grant recipient for the Pioneers of Bushwick project. The Bushwick area of Brooklyn experienced an unprecedented rise in arson, drugs, gangs and criminal-related activity starting in the 1970's and continuing through the 90's. Now, Bushwick is experiencing a resurgence - artists, young professionals and families are flocking to the area to benefit from its close proximity to Manhattan, larger spaces and lower rental costs of live and work spaces. Daryl-Ann's photographic portraits of Bushwick seniors will be paired with some of their stories to honor and serve as testament of those that lived in Bushwick during those tumultuous times. These will be presented in a community exhibition and a catalog for historical archive. Seniors' families, local community, general public and classes of students will be invited. Each year, the Brooklyn Arts Council (BAC) Community Arts Regrant Program selects to fund, through selection of project proposals by a jury panel, Brooklyn-based nonprofit organizations and artists in the areas of visual arts, film and video, photography, craft, folk arts, dance, music, opera, theater, literature/writing, and multidisciplinary arts. All regrants are available solely to individuals and organizations with Brooklyn Kings County) residency to support projects taking place in Brooklyn. "2011 ALTERNATIVEPHOTOGRAPHY.COM CALENDAR COMPETITION", publication (2nd place winner). Dec 2010. Daryl-Ann Saunders' Polaroid transfer image, Venice Bridge, won 2nd place in the 2011 AlternativePhotography.com calendar competition. 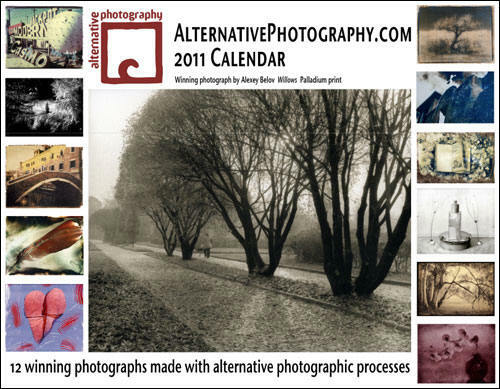 97 photographers entered the 2011 Calendar competition with a single image made via an alternative photographic process . Twenty-five hundred people selected the 12 winning photographs by voting and they are all printed full-page in a wire-bound format that measures 11x17 when open. Calendars are available for purchase and sales help support a website dedicated solely to alternative photo processes and technique. Participating Artists: Alexey Belov, Daryl-Ann Saunders, Dan Dakotas, Frantisek Strouhal Bromoil, Carolyn Snell, Fiona Howarth, Karena Goldfinch, Jim Larimer, Rosario Fandino, Claudia Wornum, Francie van der Wielen, Terry Hughes. Processes: Palladium print, Polaroid transfer, Cyanotype and van dyke brown, Bromoil, Polaroid emulsion lifts on hand-painted canvas, Gumoil, Gum bichromate over cyanotype, Salt print mixed with cyanotype, Lumen print, Solarplate etching. "SPACE FOR ART" artist residency. Awarded by Brooklyn Arts Council, Brooklyn, NY. April 2010 - ongoing. Daryl-Ann Saunders has been selected to participate in Space for Art, the pilot artist program launched by the Brooklyn Arts Council (BAC) in partnership with the New York City Department of Cultural Affairs and the New York City Department for the Aging. The program provides Brooklyn artists with work space at selected senior centers in order to bring senior citizens in direct contact with artists and the artistic process. Selection was determined by review of proposals submitted by artists throughout the five boroughs. Daryl-Ann requested and received placement at Diana H. Jones Senior Citizen Center in order to work on several projects. One, created to foster community interaction between Bushwick artists, Center members and the general public, will be "Urbanity: Interpretations of the Urban Landscape", an eight-week exhibition by emerging local artists to run in conjunction with "Color Splash", an exhibit of artwork by Center senior members. Both exhibits will be part of the annual Bushwick Open Studios (BOS)art festival and the Center's 41st anniversary on June 12th. At the end of the exhibit run, an Artist Talk will be conducted in both English and Spanish in order to be inclusive of Center members and the Spanish-speaking community. Saunders' upcoming project at the Center, Pioneers of Bushwick will pair photographic portraits of Bushwick seniors with their stories of the tumultuous years when Bushwick experienced an unprecedented rise in arson, riots, drugs, gangs and criminal-related activity from the 70's throughout the 90's. The residency will culminate in an exhibition of the portraits and writings to which the seniors' families, local community, general public and classes of students will be invited. "THE PANOCTURNISTS", online group exhibit. Feb. 15 2010 - ongoing. Curator: Tim Baskerville, Juror: Chris Faust. You are invited to an online exhibition of panoramic night photography which includes Daryl-Ann's night subway photography. Just follow the links below. The show is also accessible thru the main page of Tim Baskerville's extraordinary night photography site, The Nocturnes. Please post comments, congrats, critiques, etc. at the Nocturnes blog link below. Your comments are welcome! "ART & MUSIC", group exhibit. Barcey's Coffee, Brooklyn, NY. May 8 - August 8, 2010. EXTENDED THROUGH SEPT. 6, 2010. RECEPTION: May 8 & June 5, 2010 from 7:30-9:30pm. EXHIBIT DATES & HOURS: May 8 - August 8, 2010. EXTENDED THROUGH AUGUST 31, 2010. Mon - Fri 10-7pm and Sat 10-6pm. 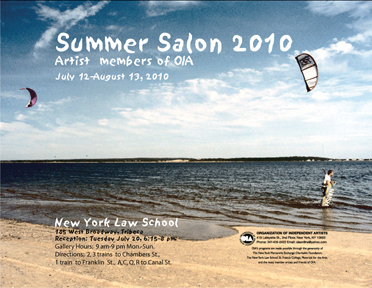 "SUMMER SALON 2010", group exhibit. NY Law School, NY, NY. 7/12 - 8/13, 2010. EXTENDED THROUGH AUG. 27, 2010. Enjoy a diverse exhibit of artwork by 29 members of OIA (Organization of Independent Artists). One of Daryl-Ann's 24x36 Shanghai night subway images, Underpass, from the "Beyond the Platform" series is on display. RECEPTION: Tuesday, July 20, 2010 from 6:15-8:00pm. Snacks, refreshments and air conditioning! EXHIBIT RUN: Mon - Sun 9am-9pm, July 10 - August 13, 2010. EXTENDED THROUGH AUGUST 27, 2010, 6PM. 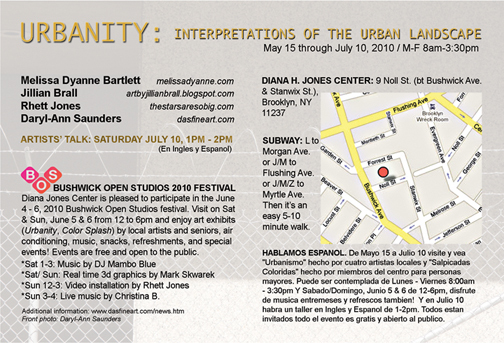 On the last day of the Urbanity exhibit, an Artist Talk organized by Daryl-Ann Saunders will be conducted in both English and Spanish at the Diana Jones Senior Center. Join us for a lively event! Artists and curator will be present. The four artists (including Daryl-Ann) will show and discuss their artistic interpretations of the urban environment through collage, mixed media, painting and photography. In addition, there will be a real-time 3d graphics area. This 8-week exhibit, curated by Daryl-Ann Saunders, runs concurrently with "Color Splash", an exhibit of paintings by fourteen senior members of the center and curated by the Center's Director, Narcisa Ruiz-Secchiano. See address, subway, events and additional links below. "COLOR SPLASH" EXHIBIT, Curator: Narcisa Ruiz-Secchiano. Artists: Zheng Chang, Joe Ellerbee, Rosa Javier, Amy Lam, Rita Leist, Carmen Miro, Feng Liam Gui, Ming Chen Hsu, Jia Cheng Hua, Zhong Xin Xu, Xian Di Yu, Bei Rong Yu, Xili Zhang and Wang Zhen Hua. ART PURCHASES: For "Urbanity" purchases, please contact the artists via their websites listed above. For "Color Splash" purchases, please contact the Center at (718) 782-3601. PRESS RELEASE MATERIALS: Please see links below for downloadable files and press release. Photos available upon request. HABLAMOS ESPANOL: De Mayo 15 a Julio 10, visite y vea "Urbanismo" hecho por cuatro artistas locales y "Salpicadas Coloridas" hecho por miembros del centro para personas mayores. Durante la semana de la exhibicion las arte puede ser contemplada de Lunes- Viernes 8:00 a.m. - 3:30 pm. Y Sabado/Domingo, Junio 5 & 6 de 12-6pm, disfrute de musica, entremeses y refrescos tambien! Y en Julio 10, el ultimo dia de la exhibicion, habra un taller en Ingles y Espanol de 1-2p.m. Todos estan invitados, todo el evento es gratis y abierto al publico. EXHIBIT DATES & HOURS: May 15 through July 10th, 2010. Monday - Friday 8am - 3:30pm. 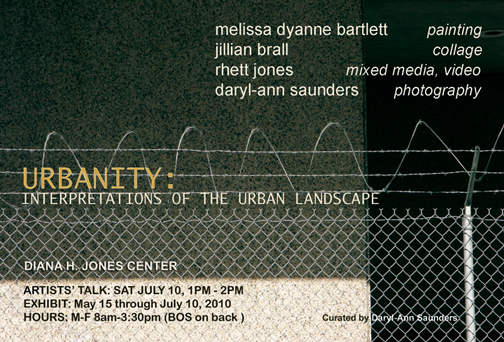 ARTIST TALK: Saturday, July 10 2010, 1 - 2pm (seating starts at 12:30pm). EXHIBIT LOCATION: Diana H. Jones Center, 9 Noll St. bt Bushwick Ave. and Stanwix St., Bushwick, Brooklyn, (718) 782-3601. J/M/Z to Myrtle Avenue. Myrtle Ave >left onto Broadway >right onto Arion Pl >left onto Bushwick Ave >right onto Noll St.
"URBANITY: INTERPRETATIONS OF THE URBAN LANDSCAPE", group exhibit. 5/15 - 7/10/10 (also BOS WEEKEND 6/5 & 6). This is an eight week exhibit organized and curated by Daryl-Ann Saunders with the objective of bringing together artwork of community seniors and local Bushwick artists in concurrent exhibits. It is the first time in the 41-year history of the Diana H. Jones Center in Bushwick, Brooklyn that artwork by outside artists is on display, with artwork by senior members of the center and that it will participate in the annual Bushwick Open Studios BOS) weekend (June 4 - 6). The four local artists (including Daryl-Ann) show their interpretations of the urban environment through collage, mixed media, painting and photography. It will run concurrently with "Color Splash", an exhibit of paintings by fourteen senior members of the center, curated by the Center's Director, Narcisa Ruiz-Secchiano. See address, subway, events and additional links below. Sun, 3-4pm: Music by Christina B.
Zhong Xin Xu, Xian Di Yu, Bei Rong Yu, Xili Zhang and Wang Zhen Hua. BUSHWICK OPEN STUDIOS WEEKEND: Sat, June 5 and Sun, June 6 from 12 - 6pm. ARTIST TALK: Saturday, July 10 2010, 12:30 - 2pm. "AMERICANA", group exhibit. MH Art & Framing Gallery, NY, NY. April 17 - May 22, 2010. MH Art & Framing Gallery in conjunction with PWP (Professional Women Photographers) presents a group exhibition of photography by PWP members that takes a fresh look at the American image in a time of globalization and multiculturalism within and outside our borders. Daryl-Ann Saunders has one artwork in this exhibit from her new series of summer night baseball and, hung salon style to accommodate the artwork of 48 artists, this exhibition opens a visual dialogue on the complex view of America. OPENING RECEPTION: April 17, 2010, 6-9pm. EXHIBIT DATES & HOURS: April 17 - May 22, 2010. Mon - Fri 10-7pm and Sat 10-6pm. "FROM HERE TO THERE", group exhibit. Morris Area Arts Council, Morristown, NJ. 7/23-1/10/10. Curator: Jeanne Brasile. A group exhibit of photography (including the work of Daryl-Ann Saunders) and other mediums will be displayed in the atrium and common areas of the 3rd floor of 14 Maple Avenue in Morristown, N.J., home to both the Arts Council of the Morris Area and the Geraldine R. Dodge Foundation. OPENING RECEPTION: September 17, 2009 from 5 to 7:30pm. EXHIBIT DATES & HOURS: July 23, 2009 through January 10, 2010. Monday to Thursday 10-4, Friday 10 to 1pm. LOCATION: 14 Maple Avenue, 3rd floor, Morristown, N.J. 07960. Contact: Karin Becker, (973) 285-5115, x14 / Fax (973) 285-1199. TRANSPORTATION: PATH train to Pavonia / Newport Station and 1-minute walk. (See "PATH Train" link below). "BLUE", group exhibit. Vermont PhotoPlace Gallery, Middlebury, VT. Dec. 8-Jan. 9, 2010. Curator: Aline Smithson. "In antiquity and the Renaissance, blue was the color of luxury, with rare lapis lazuli ground to make pigment. In early photo history, cyanotype photographs enabled otherworldly images to be made of common objects. In music, the nocturne and the blues explore the mood evoked by the color." Daryl-Ann has one artwork from a new series in this exhibit. The curator selected 5% of all works submitted for this juried show (40 photographs from 841) to be exhibited in the gallery. The exhibition will also be displayed in the online gallery and a full color exhibition catalog will be available for purchase. OPENING RECEPTION: December 11 2009, 5-7pm. EXHIBIT DATES & HOURS: December 8th through January 9th, 2010. Tues. - Fri. 11-4, Sat. 10-3, or by appointment.